Thy will be done. En avant [forward] — at all costs — en avant. 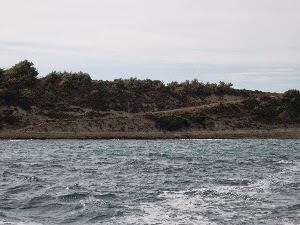 In September 2009 with one of my tour groups, I visited all seven invasion beaches of 25 April 1915 (Anzac Day), all from the land, and also viewed all of them, except Kumkale, the French landing site on the Asian side, from the water. Fortuitously, I had taken another group to Normandy the preceding June for the 65th Anniversary of D-Day. 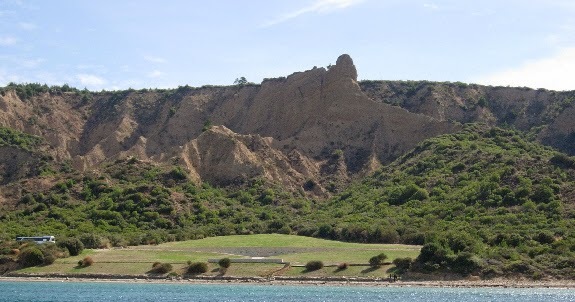 I still had the scale, lessons, and mistakes of that 1944 operation in mind when we toured Gallipoli. On invasion day the French site was a diversion, and those troops would be moved to the European side two days later, so I won't deal with them here. The five beaches at Cape Helles: S, V, W, X, and Y will be discussed as a group first. (See map) The 29th British Division (reinforced) was given the job of landing forces on all five beaches, moving inland, consolidating all its units, and moving six miles farther inland to capture the village of Krithia and the nearby heights of Achi Baba — in the first day. As it turned out, the Allies would never reach those objectives in the whole campaign. What went wrong? Historian Tim Travers says succinctly: "The reason the Allied campaign did not succeed at Gallipoli, [was] that most senior officers lacked experience of modern industrial war and thought that the attack was simpler than it actually was in 1915." A visit to the actual invasion beaches inclines one to nominate Professor Travers for some international trophy for understatement. Consider the accompanying photos. On V Beach, where the principal landing craft was the River Clyde, defenders could command the beach with machine gun fire. On Y Beach and X Beach (not shown), the formidable terrain made just exiting the beach a challenge. 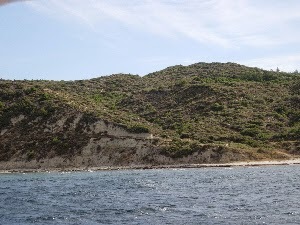 W Beach, destined to be the most important of the beaches at Helles, had both factors to deal with, difficult terrain and advantageous positions for defenders. 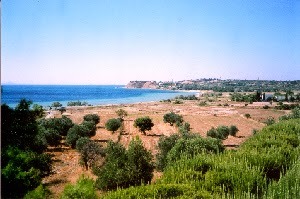 Only S Beach offered the best of both worlds — it was easy to exit and was overlooked by the Turkish defenders. Unfortunately, the forces that landed there on 25 April just sat there, unsure of what to do next. Y Beach: Difficult to Exit, No? Another problem at Helles was that the beaches were so distantly separated and the intervening land forms so irregular around the Cape with cliffs, gullies, and plateaus that there was little way they could mutually support each other or even communicate. When one actually walks the ground it appears that even had there been zero opposition at all of the landing sites, the units of the 29th Division would have had trouble finding each other, let alone consolidating and organizing an overland advance. Of course, there was opposition and these Turkish troops — for the first time in the war — were fighting for their homeland. The landing at Helles is a case study of compound military failure: failure to concentrate forces, failure to take a close look at the field of battle, failure to anticipate a determined enemy's actions. 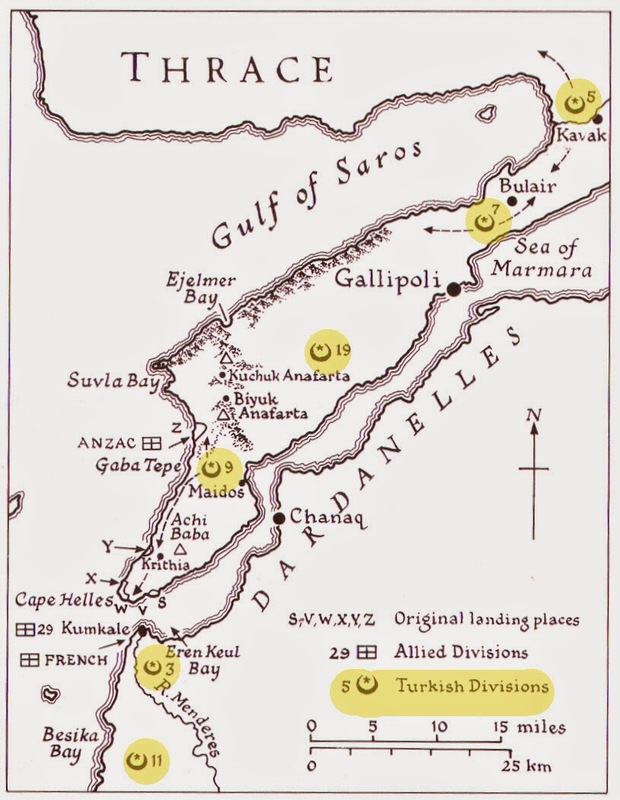 The Helles fiasco, however, pales before the mistreatment of the Anzac Corps by the generals and the planning staff 15 miles to the north of Cape Helles. 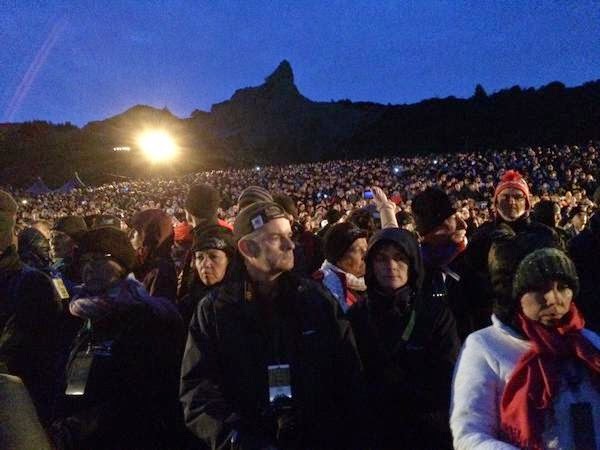 On 6 June 1944 the U.S. 1st and 29th Divisions were confronted by the formidable bluffs above Omaha Beach, and it took every ounce of heroism the soldiers could muster to get off the beach that day. On 25 April 1915 an equally brave but much smaller collection of Aussies and New Zealanders were confronted by the even more imposing geography shown below. 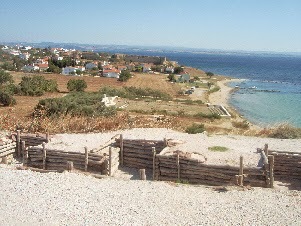 From the first day's landing, there was never a chance for the Anzacs to receive support from other beaches at Helles. They would be isolated in this awful landscape until August, facing the most competent of the Turkish commanders, Lt. Col. Mustafa Kemal, a man who knew the value of keeping the high ground, which he won on the first day and kept for the entire campaign. 2. Advance down the back slopes of the Saribair Ridge (triangle on map) across rolling ground to a heavily wooded plateau, the Kilid Bahr, which is reminiscent of the Ardennes or Argonne Forests in France, i.e. supremely good ground for the defense. The more we drove around Anzac the more my upset grew over the lads who died there in this ill-conceived venture. Once I heard of a professional football quarterback described as "just good enough to lose". The planners of the landings at Anzac were just competent enough to create certain defeat. Note: I wrote most of the above article in December 2009 and made a second visit with a group the next year. I must say that my position about the ill-considered nature of the Dardanelles/Gallipoli campaign hardened afterward. It was never a magic solution for breaking the deadlock. It was a venture doomed from its inception. Impossible! A hundred years on, it seems incredible that any sailor or soldier would agree to command such an ill-conceived operation that much to chance and luck. Only the bravery of the men ordered to execute prevented total catastrophe on the first day. Most histories of the campaign point out, as on Omaha and Utah Beach twenty nine years later, many units because of the strong currents landed in the wrong places especially at Anzac. But the allies learned from this blunder by Churchill, and others, and came back in WWII to plan the defense of England. And lessons learned from the blood of the ANZACs lead to Allied victories in North Africa and Normandy. How Was the Trench Stalemate Finally Broken?